Tributes have been paid to an Oldmeldrum woman who died following a road accident in the town last week. Helen Filson, 81, was hit by a car in Eavern Place on Tuesday morning. She was taken to Aberdeen Royal Infirmary with serious injuries where she later died. The accident, involving a grey Audi A4, happened at around 8.20am. Speaking on behalf of her family, Ms Filson’s daughter Sharon Munro said: “Mum was a feisty and energetic person who enjoyed living an independent and social life in Oldmeldrum. “She loved her family and has three children as well as grandchildren and a great-grandson who will all miss her dearly. The community have paid their tributes to Ms Filson. Mid-Formartine Councillor Paul Johnston said: “I knew Helen - she was a lovely person. 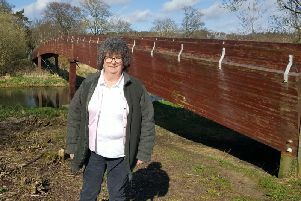 Andrew McCartney, chair of Meldrum, Bourtie and Daviot Community Council, said: “She was a very pleasant woman and it is a tragic situation. Meanwhile, student Mirela Slavova. 22, was killed in a two-vehicle crash on the A952 Mintlaw-Toll of Birness road on Monday. A man was seriously injured in the collision at around 7.30am near the former Halfway House. The accident involved the victim’s white Vauxhall Corsa and a silver Volvo XC90. The road was closed for several hours for accident investigations. Police are appealing for witnesses. Elsewhere on Monday, two adults and a child were injured in a two-vehicle accident on the A90 Aberdeen to Ellon road at its junction with the B9000 to Newburgh. Two fire units from Ellon, along with police and two ambulances, attended the incident around 4.30pm. The casualties were taken to Aberdeen Royal Infirmary with “non life-threatening injuries”. The accident caused major tailbacks of commuter traffic in both directions before the road was reopened shortly after 6.30pm.